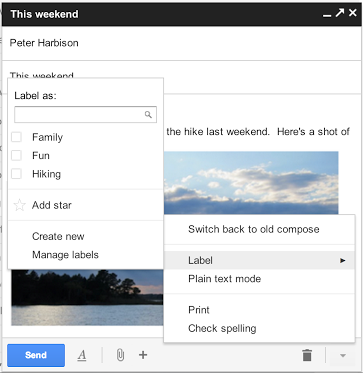 If you haven’t jumped ship on using Gmail’s desktop app, you might be happy to know that its recently released compose view has gotten a few new handy features. Today, the team announced that you can now add labels and stars while you’re composing a message, rather than waiting until you actually send it. This isn’t really all that earth-shattering, but it’s extremely handy, much like the compose screen itself. As with every product at Google, the process is an iterative one. As you look at all of its most successful services, like search and email, small tweaks keep coming, thus making it a better and better service. Rather than shipping something that is “complete,” which is an old way of thinking, in a way, all of Google’s products will always be in beta mode. Whether it has that label or not.